2014 Reading: #6 Dorothy Koomson’s The Cupid Effect – It's Time to Read! 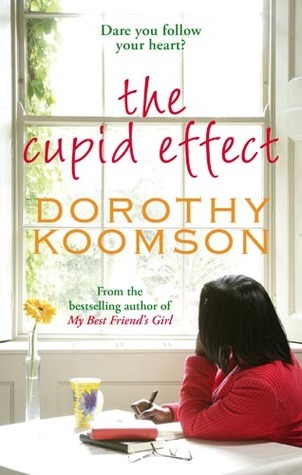 Book number 6 for me this year was Dorothy Koomson’s The Cupid Effect. This novel has been sat on my shelf for a long time so I decided to add it to my 2014 Mount TBR Challenge. Completing this book means I have now read 2 out of the 12 books I set myself to read, yay! So far, with this TBR challenge, I have to say I haven’t really enjoyed the books I have selected! I was clearly putting them off for a reason! I found The Cupid Effect to be a more enjoyable and easier to read novel than One Day but I still didn’t find it that enjoyable. It took me nearly 2 weeks to read this book – a chick lit book with only 350 pages, that isn’t great. I like Dorothy Koomson novels and have rated them highly in the past. I can’t say the same for this book. My review will be posted later so I won’t say much more. I will say however, I wasn’t that bothered by this novel, I found the protagonist Ceri to be very self-indulged and the storyline to be a bit dull and predictable.